Why the Party may pay a price for its indifference to unions. “Right-to-work” laws may sound like a good thing, because who could possibly argue against anyone's right to work? The 28 so-called American “right-to-work states” prohibit making union membership a prerequisite for employment in any workplace. In other words, workers opting out are able to reap all of the substantial benefits the union has fought for without having to contribute to the union. It's a free ride. Right-to-work states tend to have lower average wages and lower standards of living. As President Obama put it, "What they are really talking about is giving you the right to work for less money." Going after the enemy's bank account is an effective strategy. Right-to-work laws have been the major GOP weapon in their long war on labor, dating back to the first one in Florida in 1943. Donald Trump's election has energized the already intense Republican anti-union crusade, which Democrats need to be intensely aware of. According to a new working paper by the National Bureau of Economic Research, right-to-work legislation has typically decreased Democratic presidential vote share by 3.5 percent. The researchers found a similar effect on down-ballot elections down to the state legislature level. They estimate that right-to-work laws lead to both a 5-10 percent drop in Democratic representation in state legislatures and a left-to-right watering down of liberalism in the direction of the Blue Dog variety practiced in West Virginia. As both Wisconsin and Michigan enacted right-to-work laws before the last presidential election, it’s conceivable that that had more influence on swinging the election than the Russian interference Democrats are fixated on. Republicans have made some gains in the polls in the wake of the passage of the tax bill, and in 2018, five Democratic senators—Joe Donnelly, Tammy Baldwin, Debbie Stabenow, Claire McCaskill, Joe Manchin—are up for re-election in states that have passed right-to-work laws since 2012. Under Ronald Reagan’s stewardship, union membership in the 20th century began to take on the downward side of its inverted “U” shape. Simultaneously, wealth quickly accumulated in the upper tax brackets. Since the 1970s, income for the bottom half of earners, adjusted for inflation, has flat-lined. 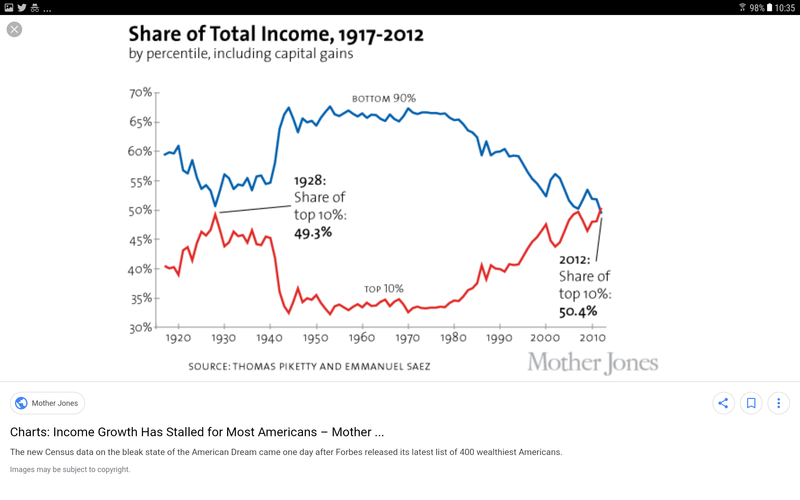 In the top half, real income has increased at rates that rise exponentially as incomes rise. The GOP power elite is fully committed to reinforcing it by continued union-busting and tax cuts for the wealthy. The Bernie Sanders wing of the Democratic Party actually has ideas to counter this 40-year pattern (the top 10 percent is now as wealthy as all of the bottom 90 percent) that makes the nation weaker every year it continues. The opioid crisis and the decline in life expectancy in the U.S. isn't happening in a vacuum. The Forbes list of the 400 wealthiest Americans is laughing at poor saps who live paycheck-to-paycheck, while Hillary Clinton Democrats, stricken with the cancer of intersectionality, tinker around the edges with their piecemeal solutions as they quietly enjoy the benefits of the growing wealth gap. Laissez-faire capitalism's natural tendency is to concentrate wealth at the very top, which the numbers support. Nothing is more effective than unionization in bucking that economic force, but the Democrats, in their shift away from workers towards elites, have taken organized labor for granted. They've sat passively by as the Republicans decimated the bargaining power of the people who need it most. The National Bureau of Economic Research study should be a wake-up call to the Democrats, who’ve had a hard time sorting out their priorities. The Party has to focus on what makes it a viable political force and come up with a short list of threats. In other words, Party meetings need to place who uses what bathroom way down on the discussion list, and right-to-work laws and the GOP war on labor at the top. If gay people could walk into any bakery and order a wedding cake, that would be ideal. That's something to strive for, but it's hardly a pressing issue. You don't get to have your pet, isolated issue placed right alongside a massive economic problem on the to-do list just because you're already living comfortably. The Republicans understand that, which is why they spend their time planning the systematic dismantling of organized labor, the single force that's kept American workers out of some modern day form of indentured servitude, while Democrats sit in meetings arguing about who's got the most privilege while instructing others how to be a good ally, as if they're on a different team. The Democrats can dovetail their fight against right-to-work laws with their commitment of standing up for all the disenfranchised minorities, which is an admirable goal. In fighting for unions, they're fighting for those very people. Studies show that the presence of unions correlates with voter turnout. Research published in The American Journal of Sociology indicates that unionization at high levels reduces the black-white wage gap among women by between 13 and 30 percent while also increasing the weekly income of black men by $49. Unions reduce racial wage and wealth gaps, and many union contracts include rules mandating fair hiring and promotion standards, leading to less discrimination in the workplace. Black workers are more likely to be unionized than any other race, and there are now more black women in unions than in previous years. Black union workers on average earn $24.24 per hour, compared to $17.78 for non-union black workers. Democrats wail about the gender wage gap, the reality of which they either don't understand or won't admit to understanding. They obsess over millionaire actor Michelle Williams making less than millionaire actor Mark Wahlberg, as if most people give a damn. If every single organized effort or awards list isn't diversified to their satisfaction, they become apoplectic. Meanwhile, the Democrats been sitting on their soft hands for decades, watching Republicans return the U.S. to the Gilded Age.